Cream together the butter and sugar. Add in the molasses and then mix in the eggs 1 at a time. Then add the vanilla. Scrape down the sides of the bowl. In another bowl whisk together the flour, baking powder, salt, ginger, cloves, and nutmeg. Gradually add the flour mixture to the molasses mixture, scraping down the sides occasionally. Cover the cookie dough with plastic wrap and refrigerate for at least 2 hours. Preheat the oven to 350°F. Using a tablespoon, spoon the dough out onto an ungreased cookie sheet about 2" apart. The dough is SUPER sticky! But it bakes up pretty and round, I promise. Bake for 8-9 minutes. Let the cookies cool for about 5 minutes and then use a sharp knife to slice each baked round into 1/4 - 1/2" slices. Lay the slices on one side. Then bake again for 4 minutes. Let the cookies cool completely before glazing. Mix powdered sugar with orange juice and orange zest. Dip half of each baked cookie into the glaze. You can use a spoon to assist. Lay the cookies on a piece of wax paper or foil to let the glaze set up. 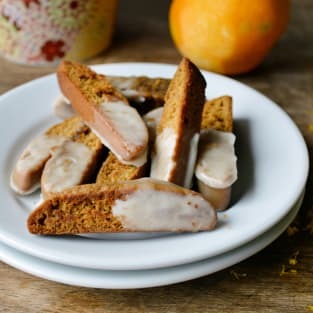 This biscotti recipe can be made into tons of tiny little cookies (instructions provided above) or it can be baked into about 24 large, more traditional biscotti cookies. To bake the larger cookies, divide the dough in half. Recover and refrigerate the portion that you aren’t baking just yet. Pat the half you are baking into an oval that’s about 3/4” thick. The dough will be SUPER sticky. No worries! It bakes up pretty. Bake it at 350°F for 25 minutes. Let it cool for 5 minutes, slice into 12 pieces, lay the flat on one side, and bake again for 12-15 minutes. To glaze the larger cookies I like to drizzle it all across the top.